Wash lentils thoroughly and put in a saucepan of cold water to soak while you move on to the next step. Put the chickpeas in a freezer bag with just enough olive oil to lightly coat them. Gently rub the bag to ensure even coating before tipping them out into the tray. Put the tray in a cold oven and turn it on to 130 C.
Remove from the oven every 10 minutes to shake/roll the chickpeas around in the tray. Continue doing this until they’re dry and crunchy. Remove from oven and put aside. Turn oven up to 180 C.
Put all vegetables and dry spices (excluding saffron) into a large mixing bowl with olive oil to lightly coat them. Rub with your hands to ensure everything is evenly coated. Put bay leaves in a large roasting tray and tip the veggies on top of them. Pop into the oven. Roast until the veggies start to caramelize, turning every 15 minutes or so. Meanwhile you can move on to the next step. Put the saucepan with the lentils on the stove and bring to boil. Reduce heat, pop lid on and simmer for 25 min. Rinse in cold water, drain and put aside. Remove veggies from the oven when they’re done and after they have cooled enough to touch, squeeze the garlic out of their skins. Put all the veggies into a large soup pot with almond milk, water, yoghurt and saffron. Bring to boil and simmer for 10 minutes. Remove bay leaves from the pot and use a stick blender to blend until smooth. Add lentils to the pot and simmer for another 10 minutes. 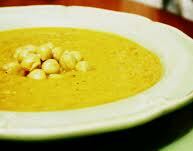 Serve hot and steamy in a large soup bowls, topped with the crunchy chickpeas.